Tomatoes are taking over our lives!!! Our garden is spilling over, they’re arriving in our Organics to You shipments, and the farmers are selling the most amazing heirlooms right now. We’re eating tomatoes for breakfast, lunch and dinner and we’re getting creative with these juicy little suckers. 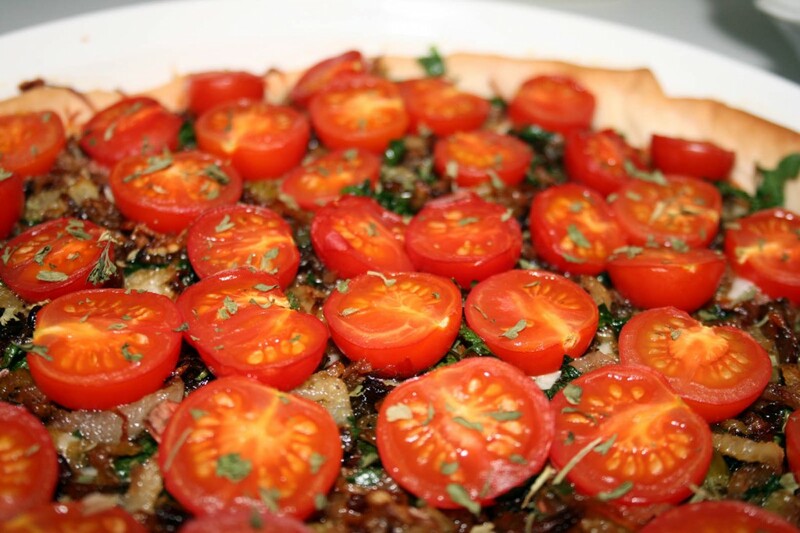 This tomato fennel tart, inspired by a recipe from Sunset Magazine (Nov 2005) put a smallish dent in our ever growing tomato supply and allowed us to put the fennel from Organics to You to use too. 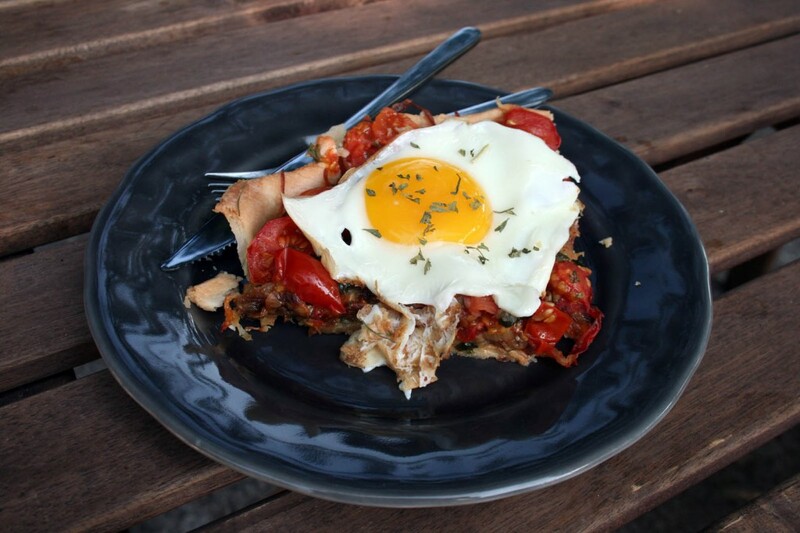 As an added benefit this tart is perfect topped with a sunny-side up egg for breakfast. 1. If you made your Cheese Pastry Dough roll it out so it’s atleast 12 inches diameter and transfer to your tart pan . If you’re using a pre-made pie crust simply unroll and transfer to your tart pan. Trim off any overhanging dough, poke holes in bottom of crust, cover with plastic wrap and put crust in the freezer for 30 minutes while you cook the fennel and shallots. 3. Heat medium sized frying pan on medium-low heat and add olive oil, fennel, and shallots. Stir frequently till fennel and shallots are a caramel colored brown, approximately 30 minutes. 4. Sprinkle veggie mix with 1/2 cup parsley, add salt and pepper to taste and remove from heat. 5. Pull your crust out of the freezer and bake in oven for 20 minutes. If you are using a pre-made crust sprinkle the crust with the gruyere before baking for 20 minutes. 6. Once crust is golden brown remove from the oven, layer the parmesan cheese on the bottom of the crust, then the fennel/shallot mix, and finally add the sliced cherry tomatoes. 7. Bake in the oven till cheese is golden brown, approx. 10 to 15 minutes. 8. Garnish by sprinkling with remaining Italian parsley. Steve and I had leftovers, so for breakfast we added a sunny-side up egg to the top of the reheated tart and it was delicious!!! This tart is excellent served with a simple arugula salad tossed in a homemade lemon vinaigrette. This entry was posted in Appetizer, Dinner, Eat and tagged Autumn, baking, breakfast, cheese, dinner, fall, fennel, gruyere, harvest, parmesan cheese, shallots, tart, tomato, tomatoes by autumnadams4. Bookmark the permalink.